It's been a while! 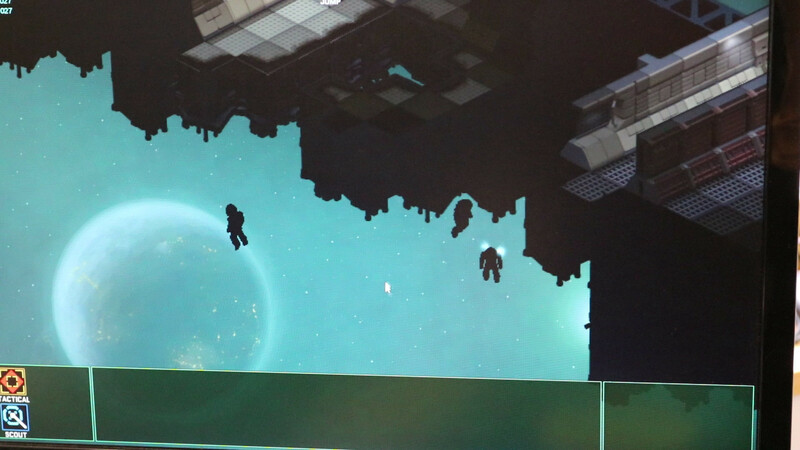 But fear not, silence means we are busy being hard at work We've been working on a random ship generation system. It was quite a large task since we had to determine rules for how we want ships to generally look like and have some logic to it all. Things like crew rooms being their own section, instead of scattered around all over the ship. Engine room should obviously be in the back of the ship, not in the middle. Command center looks good at the front of the ship, but can be put at other sections of the ship as well. This system will give you the opportunity to explore a refreshing amount of randomly generated ship wrecks, and face other groups fleeing from Earth with their own ships. 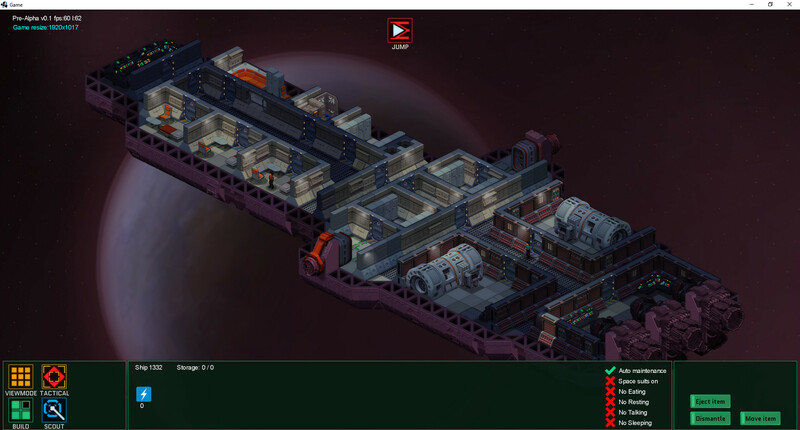 The system will not only allow for how the content could be shuffled within a ship, but also the structure of the ship itself. With it being larger or smaller depending on the seed. In the gfycat above we show our first test of random content generation in a ship. 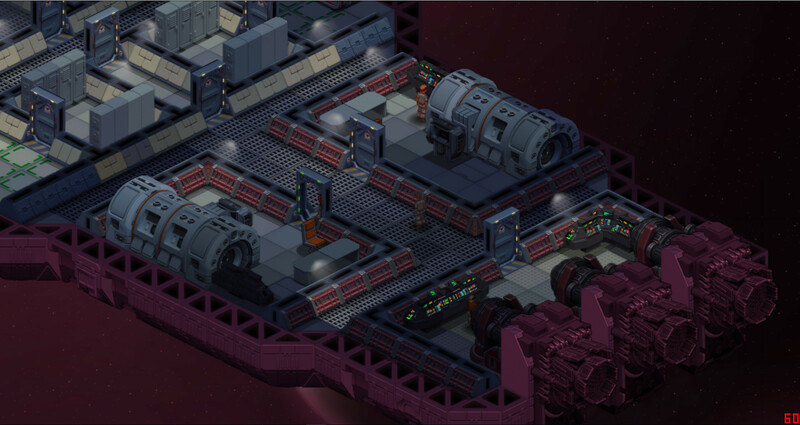 In addition to the random ship generation system we have worked on the lighting system and made it better. Enjoy these new screenshots, which shows how the game is looking currently. Grabbed this shot from our programmers screen. Lighting is starting to be on point! Lone crew member feels lonely. In-game screenshot from the current Alpha version. A shot from a ship engine room. And it got caught on fire! Quick! Get the Extinguisher! Ship and various facilities to build. 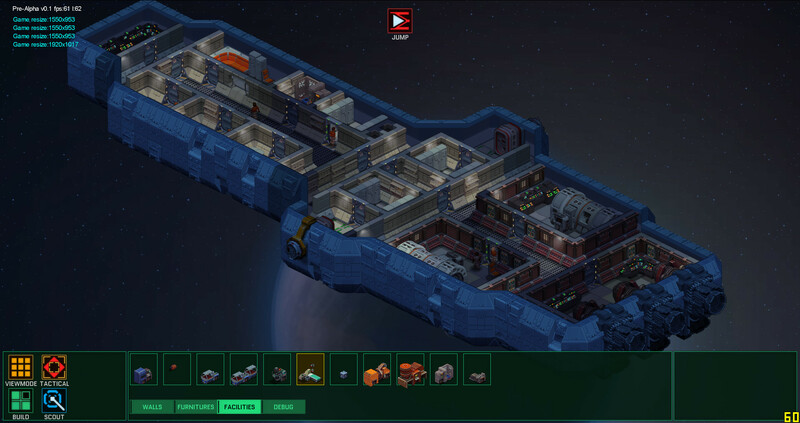 You will be able to build the ship from ground up tile by tile, wall piece by wall piece. Crew about to board a wrecked ship and investigate what's going on. We've also just started creating some first weapons and shooting. Decided to grab a short clip of our first test seen above! More on this in a later update. Amazing looking,Im still very excited to see the battle system,the most important part for me,and upgrading of course. This is awesome but I must say the silly side of me looked at the last two screen captures and had to laugh. Second to last has a 'jump' button, then the last picture notes a few people below the ship. (I know the caption said a crew is about to board.) Like I said, silly. And as Madmandom notes, seeing what the battle and upgrade system looks like would get me even more excited. Nice job and thanks for the looksie! You can rotate the view? When you talk about the upgrade system, what do you mean specifically? Ship upgrading,character upgrading,turret or weapon upgrading,honestly anything upgrading is important,it will keep me coming back and want the next upgrade,thats what keep me playing games,i know if I get that upgrade the next mission might be easier,kinda like a tower defence game when you upgrade a tower it looks diffent and becomes a little stronger,that give a incentive to come back and ant more,and it keeps the game fresh all the time. Alright, we hear you. The ship part is pretty clear at this point, start with a small ship and be able to expand it to become bigger. 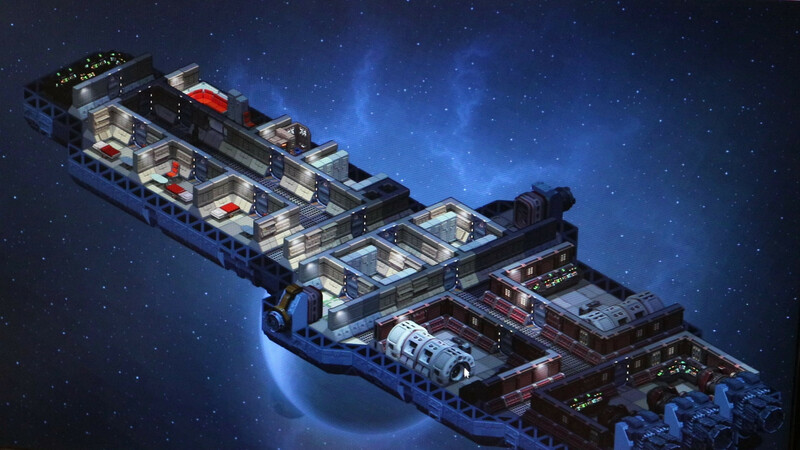 Build your own composition of rooms and facilities inside the ship. Rest is still open Battle components will be there, but battle won't be the sole focus of the game. I would say our thought now is to let the player decide how he wants to play the game, and how much battle he wants to do. If he wants to try to survive in another way. Would be great to make different play styles possible! (04-04-2017, 09:25 AM)AdmiralGeezer Wrote: Alright, we hear you. The ship part is pretty clear at this point, start with a small ship and be able to expand it to become bigger. 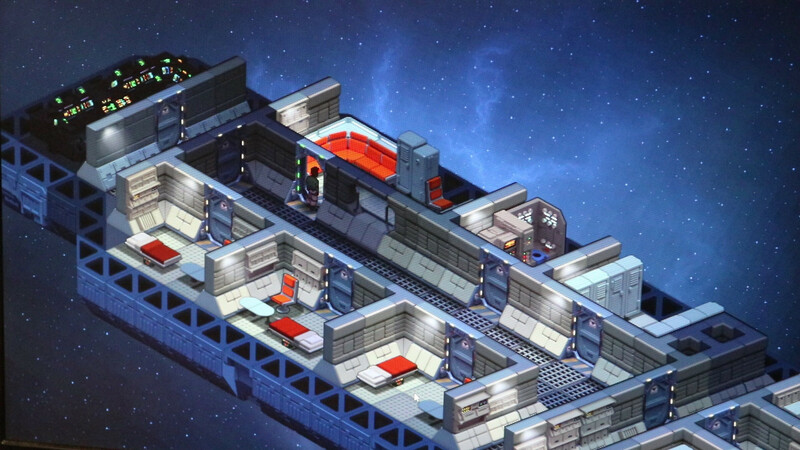 Build your own composition of rooms and facilities inside the ship. Rest is still open Battle components will be there, but battle won't be the sole focus of the game. I would say our thought now is to let the player decide how he wants to play the game, and how much battle he wants to do. If he wants to try to survive in another way. Would be great to make different play styles possible! 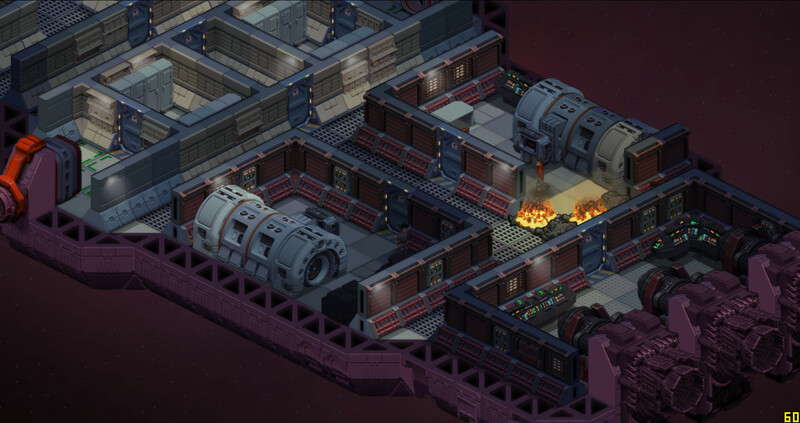 What your saying about the ship sounds brilliant,fun,and has great incentive,when you say build your own composition of rooms do you mean we get multiple choices of what rooms go where we want in the ship,and do those room invovle weapon rooms like turrets? Whats very interesting is,you said "if we want to survive in another way" are you saying we can have battles in different ways? And not the same way each time,diffent options for battles is not something I experienced on a tablet before,sound amazing,and alot of work on your behalf.I noticed you said nothing about the crew members,will they have weapons,that can be swapped out for better weapons as we progress? As it is currently, you can build a chair, table, and whatever furniture we come up with as separate entities. You can build your rooms in whichever way you want, tile by tile, wall piece by wall piece. Regarding expansion our current thought is that it would be done in modules, 2x2, 4x4, 8x8 module pieces that expand your ship hull and gives you more room to build on. Regarding turrets I'm not yet sure how we will implement those into the game, they could be attached to the hull and perhaps have command modules in rooms inside the ship. Regarding the "if we want to survive in another way" phrase: I mean that it would be possible to play the game and survive by being aggressive and attacking other groups, or then play in a way where you try to negotiate or trade to solve hostile situations. Different weaponry for crew members is planned yes, rifles and grenades. What I'm trying to say is that we have thought that this game would not only be centered around battle, it's there but it's just part of the game, much like Rimworld. The core of the game would be to flee Earth, try to find that Haven somewhere, build and expand, and about the choices the player makes to help his crew survive the journey. (04-04-2017, 11:50 AM)AdmiralGeezer Wrote: As it is currently, you can build a chair, table, and whatever furniture we come up with as separate entities. You can build your rooms in whichever way you want, tile by tile, wall piece by wall piece. Regarding expansion our current thought is that it would be done in modules, 2x2, 4x4, 8x8 module pieces that expand your ship hull and gives you more room to build on. Regarding turrets I'm not yet sure how we will implement those into the game, they could be attached to the hull and perhaps have command modules in rooms inside the ship. That all sounds amazing,the part about adding turrets to the hull sounds amazing,please add that if possible,maybe like your other great games,these turrets could be swapped out by trading,or blowing other ships,thanks for all the details,I now know how the game will work,and it sounds great,I have one more question,when the crew or turrets fire there weapons can the bullets be as cool and bright in colour like your other games.